The Joys of the Season to You and Yours! We live in different parts of the same state, some rural, some urban, but all inspire our creativity. Yes there’s nothing we can’t accomplish right where we are. Opportunities for creating abound around us. 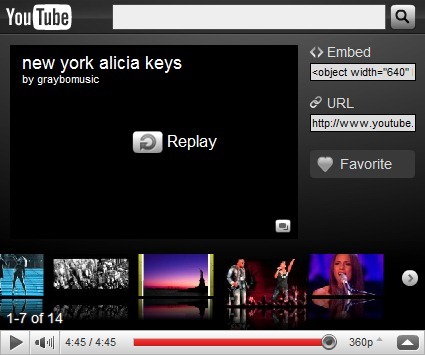 What a great era to view the world with artistic eyes; there’s inspiration everywhere. May your holidays and the New Year ahead bring you wonderful experiences and creative satisfaction in all that you do! 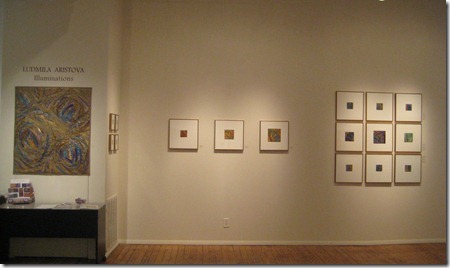 View of the Noho gallery with Aristova’s works on display as part of the Illuminations” exhibition. A catalogue is available. Please call 212-367-7063. “Fold”, Tegan E. Ford, 5” x 3” x 3”, copper leaf, felt, hemp, 2010. 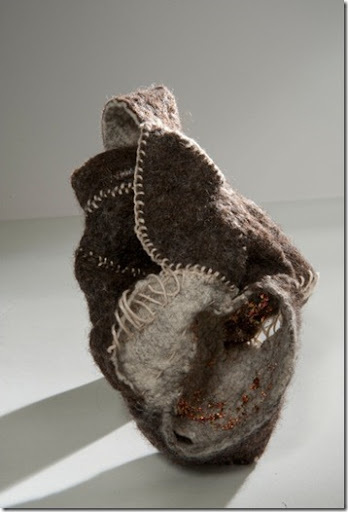 Tegan E. Ford, a senior at Buffalo State College in the fiber art program, recently submitted and had a piece accepted in the "What’s Next! : 2nd Annual Undergraduate Juried Show" held by Bradley University Galleries in Peoria, IL. The show runs January 3 – February 4 with the Reception February 3, 6:00 – 7:30 pm. 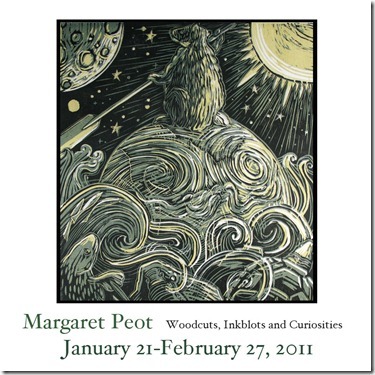 Margaret Peot’s solo exhibition, Woodcuts, Inkblots and Curiosities, will be on view at The Galleries at Saint Peter’s Church from January 21-February 27, 2011.
on January 31, from 6-8PM. Rachel Rose is launching a new business with a line of hand-painted silk tees and is eager to exchange marketing and sales ideas with other SDA members. Any veterans out there who would enjoy sharing your expertise with her? Pat Pauly has two works on view in the current "Quilts=Art=Quilts" exhibition at the Schweinfurth Memorial Art Gallery in Auburn, running October 31, 2010 – January 9, 2011. 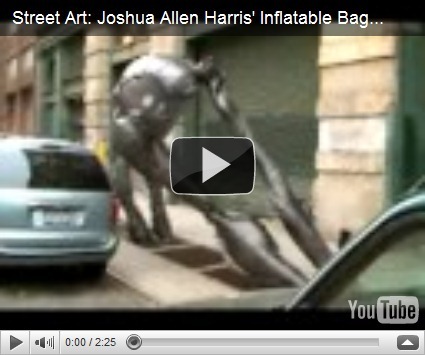 Her piece "Stacked Mummy Bags," was awarded first place in the juried and judged exhibition. 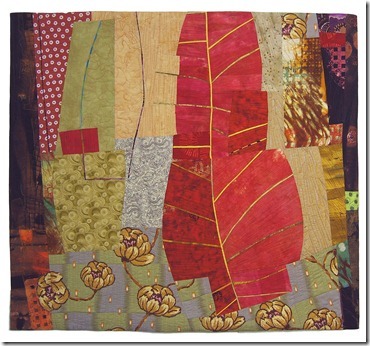 Pat Pauly, “Pink Leaf”, at Quilts=Art=Quilts. 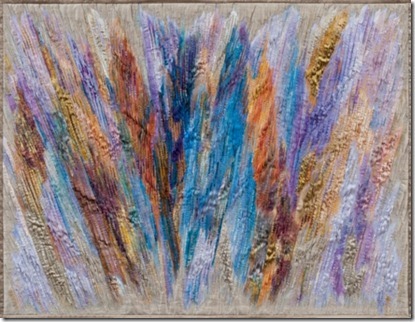 Pat Pauly’s work has also been accepted in the 2011 Quilt National Exhibition that will open May 28 2011. THE ArT- QuILT ExPERIENCE exhibit celebrates the diversity and innovation found in today’s quilts. Marilyn Henrion Prints Now Available! Fine museum-quality reproductions of Marilyn Henrion’s artworks are now available at affordable prices, starting as low as $63.50. Newly added images include digitally manipulated photographs from the artist’s mixed media series, "Soft City", as well as selected art quilts. Prints are available in various sizes and can be ordered with or without customized frames, mats, and other accessories! All prints are shipped within three business days and come with a no questions asked 30 day return policy..
NEW! The images are also available on customizable greeting cards. SPECIAL HOLIDAY BONUS! Receive a 10% discount on all purchases between now and December 31, 2010 by specifying Code # VTALPY at checkout. Click here to order original artworks through the artist’s website. If you are an artist, designer, Color Specialist Certificate student or have a creative eye and are looking for fresh career direction find out how color knowledge and talent is extremely marketable in fashion and related businesses. Meet a panel of successful professionals from a variety of fields that use color strategically for branding, cosmetics, fashion home markets, textiles and retail. How they use their color expertise is the bedrock of their success. Gain insight into how you can use your own color strengths to distinguish your employment opportunities and enhance your promotability in fashion and beyond. Moderator: Barbara Arlen & color career panelists from several industries. Paint with color as a professional by learning how to mix, paint and create your own color chips and color schemes through this hands-on study for the use of mixing colors for fashion, accessories, home, branding, cosmetics, personal image, graphics and painting. Strengthen your ability to visualize the appearance of basic hues and their variant tints and shades, exploring the potential intensity and or muted effects of color combinations, lighter and darker. Use Josef Albers’ juxtaposition and harmonies of color and get tips on color mixing, matching and selection for different products. Most studio supplies included in course fee and basic supplies available in the classroom. Some additional supplies necessary, approximately $50 recommended at first session. Bring a smock or cover-up to all sessions.